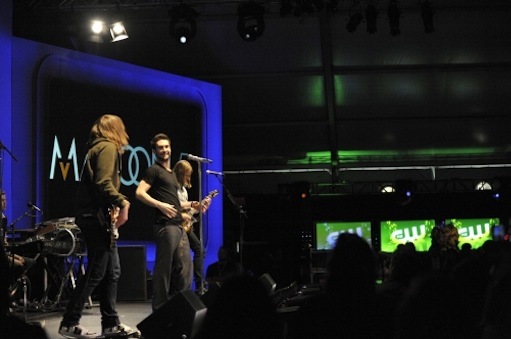 The inevitable Maroon 5 played at CW's "upfront" session in NYC. Details can't even be called sketchy. But The CW and its new Sunday night business partner, MRC (Media Rights Capital), at least have announced the titles and creators of four planned new series. There's no casting announcements or footage yet, though. Production on all four shows supposedly will begin in mid-June, although a possible actors' strike might quickly stop any startups. ***In Harm's Way, a reality show about "people doing dangerous jobs" from Dirty Jobs producer Craig Piligian. ***Surviving Suburbia, a comedy about a "family and their new neighbors" from Kevin Abbott (Roseanne). ***Valentine, Inc., a dramedy built around a dating agency that "finds lost loves, true loves and mends broken hearts." This one's from Kevin Murphy (Reaper). ***Easy Money, featuring a "family that runs a high-interest loan business." Producers Andy Schneider and Diane Frolov have The Sopranos in their blood among other dramas.